Well, after a flurry of new beers including our City of Ale collaboration brews with Northmaen Brewery, from France and Poppyland of Cromer we had a store cupboard full of wonderful ingredients and part opened bags of hops and grain. Now you know what we like to do when that happens! Yup, its time once again to mash it up for a mystery brew. You seem to have really taken our mash up brews to heart and love the fact that no two brews will ever be the same. The only constant is that the abv will always be 4.4%. So, what can you expect from our latest Mash Up? 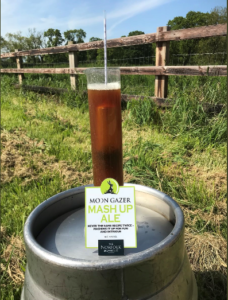 Well, for starters the malt has a European feeling about it, as we will be using the remaining French grown malt from our good friends from Northmaen Brewery, in Rouen and adding to it some Munich and Vienna malts. To add touch of sunset red colour to the beer we have also thrown in some Chocolate, Crystal, Rye and Caramalt for good measure. Its an absolutely wonderful dark red hue, which after a couple of amber colour Mash Ups will ring the changes. As for hops, well there’s lots of them, plenty of varieties, kicking off with New Zealand Dr Rudi for the bittering before adding French Barbe Rouge (aka Red Beard) then finishing with an avalanche of American hops with Ekuanot and Jarrylo. Leaving this fine 4.4% robust beer having a complex malt flavour with grapefruit, tropical fruits and herbal flavours in an abundance! It’s a one off and will be finding it’s way in to pubs from 29th May – so look out for it and enjoy.